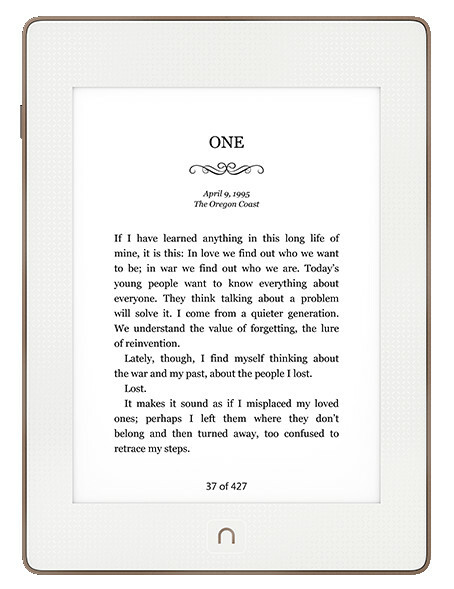 Barnes and Noble has released a new dedicated ebook reader called the Nook GlowLight Plus. It’s available now online and from Barnes and Noble retail stores for $129. The Nook GlowLight Plus is a 6-inch ebook reader, like previous Nooks. What separates this model is the fact that it has the latest high resolution 300 ppi E Ink screen. Plus the new Nook is waterproof and dustproof. And it features an aluminum body for a higher-end feel and increased durability. B&N also claims the screen is fingerprint and scratch resistant. Given the fact that it’s waterproof and scratch resistant, it probably has a flush glass screen like the Kindle Voyage and Kobo Aura, but it’s impossible to tell from B&N’s photoshopped images. The new Nook comes with 4 GB of memory, with about 2.5 GB available for Nook and sideloaded content. Once again a lot of people are going to be put-off by the lack of a memory card slot and the limited amount of storage space. But at least sideloaded content isn’t partitioned into a smaller space like the previous Nooks. Battery life is rated at up to 6 weeks, a couple weeks less than previous Nooks. That’s one drawback of 300 ppi screens—they use more battery power. As far as waterproofing, the new Nook is IP67 certified. That means it can survive being in up to 1 meter of water for up to 30 minutes. The Nook GlowLight Plus looks like a good ereader on paper (pardon the pun) with the high-res frontlit screen and waterproof design for $129. But I can’t help but notice there’s little mention of any new software-related features, except a new B&N Readouts discovery tool and profiles for sharing the device. B&N continues to lag behind Amazon and Kobo in terms of software features: Kobo has a wide variety of font customization tools and added features like reading stats and translations; Amazon has things like X-Ray, Word Wise, Goodreads, exportable notes and highlights, instant translations, and so on. Once again this new Nook has the feel of B&N wanting to give existing Nook owners a reason to upgrade, but they still aren’t giving potential new customers many reasons to switch to using a Nook. Check back in a couple weeks for a full review and video walkthrough of the Nook GlowLight Plus. Is there an e-ink reader with front light and sd card slot that can be used to read B&N epubs as well as being able to install the Kindle ereader app? I want it all in one device in other words. It would probably have to have the Google Play store in order to do both. No, not really. There are other E Ink ereaders that run Android and have microSD card slots and Google Play, like the Boyue T62, but Android apps aren’t designed for E Ink so they usually don’t work very well. The Kindle app is usable but the Nook app just crashes most the time on E Ink. It seems to me that there’s a market opening for an “open e-ink reader” which can be used to purchase and read content from multiple different vendors. That might revive the struggling e-ink sector. I’m one of the few people I know who owns an e-ink device, and these days I do most of my reading on a tablet. I beg to differ with Nathan. I’ve been using Icarus Illuminas (an older 4 GB/Android 4.0 and a newer 8 GB/Android 4.4 models) for almost 2 years now. They are identical hardware to the Boyue T61. In both of them I have installed the Barnes and Nobles app, Kindle, and Mantano Premium and I have not seen serious reading/performance problems. Among them, Mantano is the best performing. I just download the Barnes and Nobles epubs and PDF and transfer them by email, usb, or dropbox to the MAntano app in the ereader. Neither came with Google play installed, but it was very easy to sideload (less than 10 minutes of googling and crafting). That said, the eInk is in fact not very good at rendering the full spectrum of colours. As far as I know, the best ereader to “translate” colours into eink for user readability is the Onyx Boox brand. It seems like the Onyx “modifies” some colours or contrasts in the apps so they can be visible on an eink display. There is a video review on cNet of the device. It does indeed “look” like it has a flush front. Yes this is absoutely correct. Automatic NO Sale. What is it with B&N fanaticism with white? Is this the only color option also as it was with the last glowlight? Look at the bezels! Good grief, the ereader is half screen and half bezel. One has to wonder if Amazon has inside information to what B&N is doing and is precisely the reason they discounted the Paperwhite on the exact week it is announced. As for the new Nook, the last one was a complete flop and yet BN sticks with the same failure formula (No SD, limited sideload content) WTF!?! It looks like an ipad 2 with a thick ugly bezel. Sincerely, why is the lack of an SD card an issue? My e-reader is really only good for reading e-books and 2.5GB is a *lot* of books. On my Nook SimpleTouch w/ Glowlight, I think I only have 250MB of space, and it has never been an issue. B&N has corrected their web site to show that the 2.5GB of user space is NOT partitioned. B&N content and side-loaded content share the same space. Thanks for info. I updated the article. The bezel is an odd light ivory color, not pure white like early photos show. In store the ivory bezel seems to contrast a light bluish screen. The screen and bezel are flush(but with two different materials). The metal edge is a little harsh. It is light.